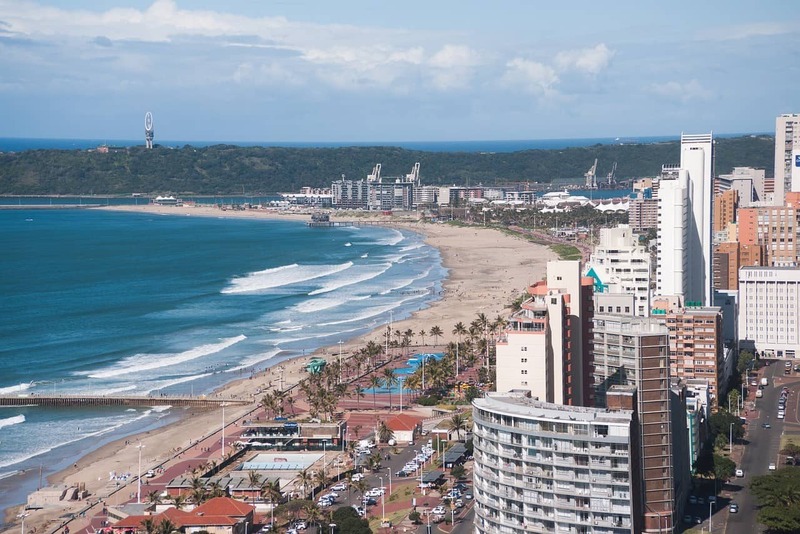 Durban, South Africa may be known for its spectacular shorelines and balmy weather but there are so many more things to do in Durban than just beach towels and surfboards. The rich mix of Zulu, Indian, and colonial cultures can be seen in the city’s eclectic architecture and tasted in the local cuisine. Durban is packed with opportunities for adventure, from high-adrenalin water sports to the world’s tallest swing. Just a short way outside the city dramatic landscapes and cultural experiences await while a few hours’ drive will put you in the path of the world’s most majestic animals. We recommend to compare prices and options for places to stay on Booking.com, which has been pretty good for planning travels in the area. They also have an excellent range of accommodation in Durban. Otherwise Couchsurfing is always a great choice if you’re into that scene. Now that you’ve found a good place to stay, let’s get out there and find the best things to do in Durban! The spectacular stretch of beach known as The Golden Mile is the ideal spot to catch the sunrise. If you’re not an early riser, the beach provides lots of opportunities to chill out with the locals, soak up some sun, or sit back and sip a cocktail. For a more active day, rent a bike and cruise along the waterfront all the way from the Blue Lagoon to Ushaka or sharpen your bargaining skills with the local market vendors. 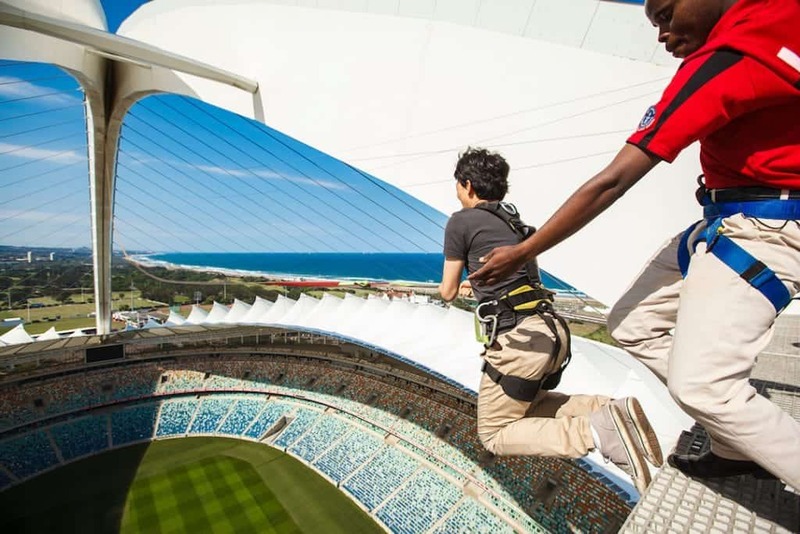 Embark on an Adventure Walk to the top Durban’s Moses Mabhida Stadium — which hosted the semi-finals of the 2010 World Cup — and take in the spectacular 360-degree views of the city. If you can’t handle the trek, the stadium’s SkyCar will get you there the easy way. Once at the top, venture to the 70-metre high Big Rush Big Swing, named the World’s Tallest Swing by the Guinness Book of World Records. Make the leap from the top and swing gently right into the bowl of the stadium! Opened in 1985, the Hare Krishna Temple of Understanding is an architectural wonder, with three tall gold and white domes reaching towards the sky above an octagonal roof. Inside, the ornate decorations have a little something for everyone, with its east-meet-west, modern-meets-tradition-meets-futuristic style. Attend an Arati service, spend a tranquil afternoon working on your inner peace, or just hit up the Govinda’s restaurant for a tasty vegetarian meal. Dating back to the 1940s, Bunny Chow originated in Durban’s Indian community and soon became a favourite across the city. Bunny Chow is the original take away food; a hollowed out loaf of bread is filled with curry to make a portable lunch, no styrofoam needed. Though Bunny Chow is now available with various meat curries, the original was vegetarian. If an entire loaf sounds like way too much, order a “kota” which is made from just a quarter loaf. 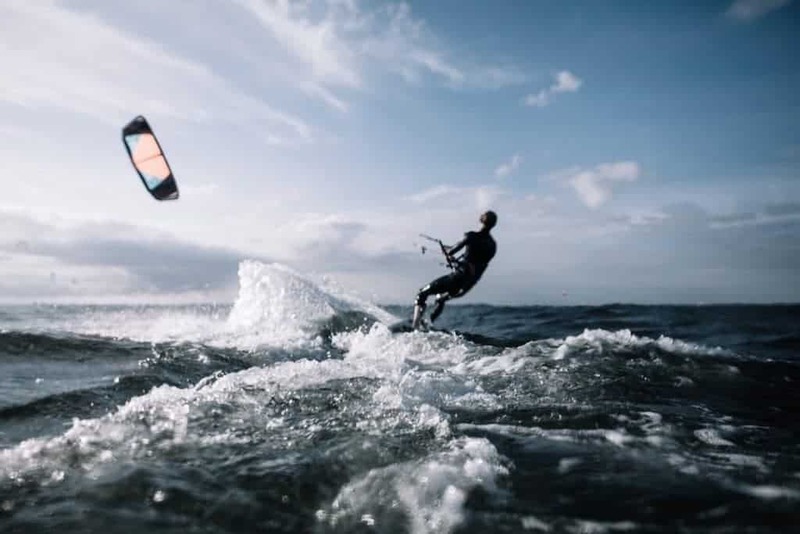 Durban might be better known for its spectacular surfing but you’ll find lots of perfect spots for kiteboarding, too. You can get up and flying on the waves in as little as two lessons but making time for a few more will help build your confidence and enjoyment. With year-round hot weather and warm water temperatures, there’s no need for wetsuits. Just be aware that sharks patrol Durban’s warm waters! Luckily, all of Durban’s beaches are protected by shark nets. There’s nothing like a traditional market to immerse you in the local culture and Durban’s impressive Victoria Street Market will do just that. Durban is home to the largest Indian population outside of India so don’t be surprised to find colourful barrels of Indian spices and bundles of fragrant incense sold by men in kurtas and women in Saris. The market provides plenty of traditional African products to pique your interest too. While the lower floor of the market is dedicated to fruits, veggies, fish and meat, the upper floor is a great place to stock up on souvenirs and locally made jewellery and clothing. 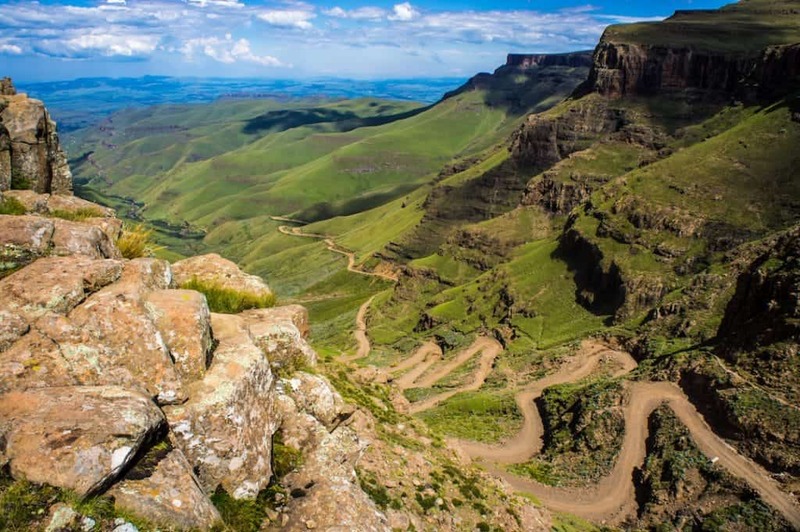 The Sani Pass, a World Heritage Site rising 2874 metres above sea level, is just a short drive from Durban. The 33 km gravel road climbs the mountain in a series of sharp switchbacks, hugging to the cliff walls of the Drankensburg escarpment. Marvel at the views and get a chance to visit the local Sotho people, a sheep and goat-herding tribe who live a traditional life high in the mountains. Grab a drink at Africa’s highest pub before heading back into the city. In the Valley of 1000 Hills, visitors can spend time gazing out at the dramatic landscape and trying to count each of the thousand hills. A visit to the Phezulu Safari Park will give you insight into the culture of the local Zulu people, teach you how Zulu spears and shields are made, and give you a chance to enjoy a traditional Zulu dance show. 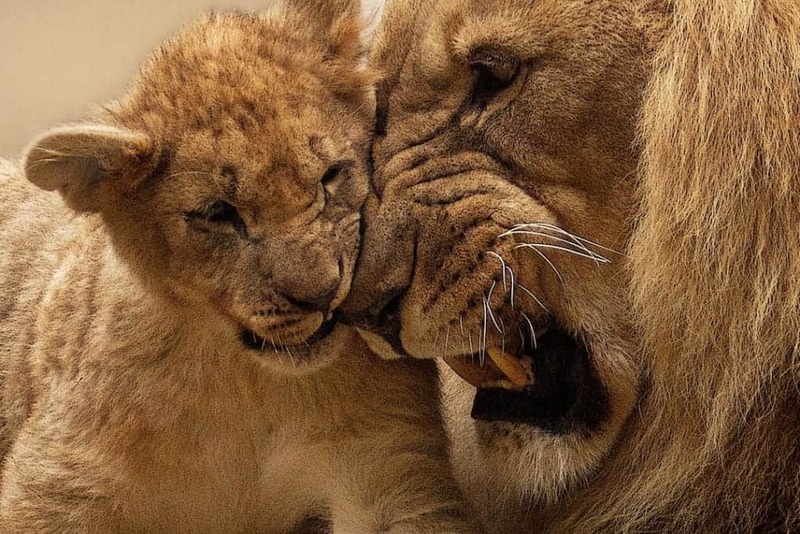 From Durban, book a day trip to Hluhluwe-Imfolozi Park, where the Big 5 — African elephants, African lions, Black rhinoceroses, African leopards, and the Cape buffalo — roam freely. The park is also home to the biggest population of Southern White Rhino in the world. Explore the 96 000 hectares from the back of an open vehicle or get out and walk on foot for your chance to look one of these magnificent creatures right in the eye. Whether you want a vibrant city experience, a laid-back beach holiday, an adrenalin-fuelled adventure, or a bit of each, Durban has you covered. Definitely add it to your South Africa vacation when you’re coming to this beautiful country.